Before you can (or should) install the App-V 5.0 Reporting Server certain prerequisites should be met. I won’t sum there here as they are summed at the TechNet Library. Unfortunately not all prerequisites are clear or missing. Besides the x86 version of the Microsoft Visual C++ 2010 SP1 Redistributable Package you also need the x64 version. This makes sense since the 64-bit ASP.NET registration is requested. When Microsoft Visual C++ 2010 SP1 Redistributable Package (x64) is NOT installed you’ll receive the following error on the App-V 5.0 Client: AppV Error Code: 1300000013. 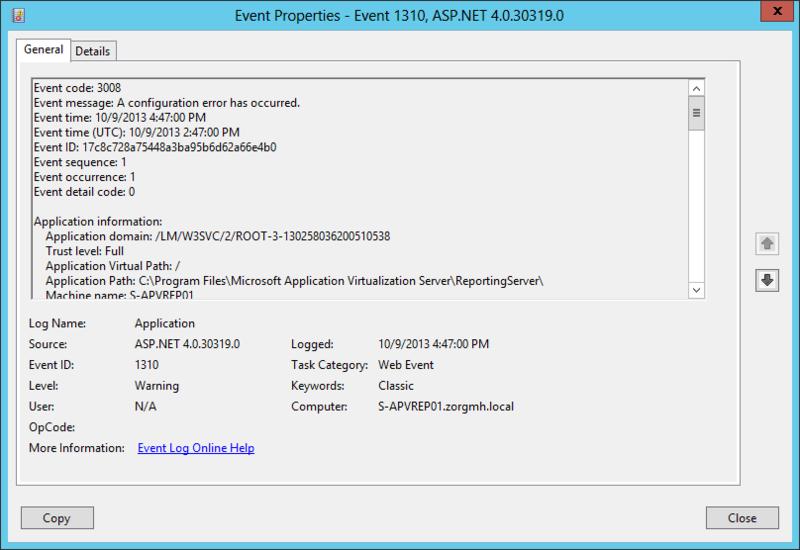 Additionally an error event is raised on the client by Microsoft-AppV-Client/Admin with ID 17006. 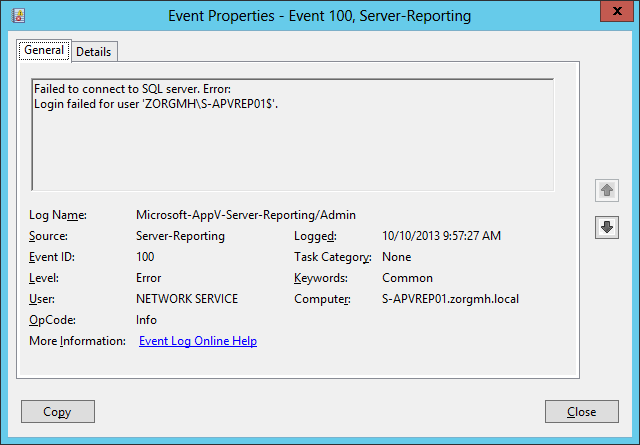 On the App-V Reporting Server a warning event is raised by ASP.NET 4.0.30139.0 with ID 1310. The computer account of the App-V Reporting Servers requires a SQL login with sufficient (dbOwner?) 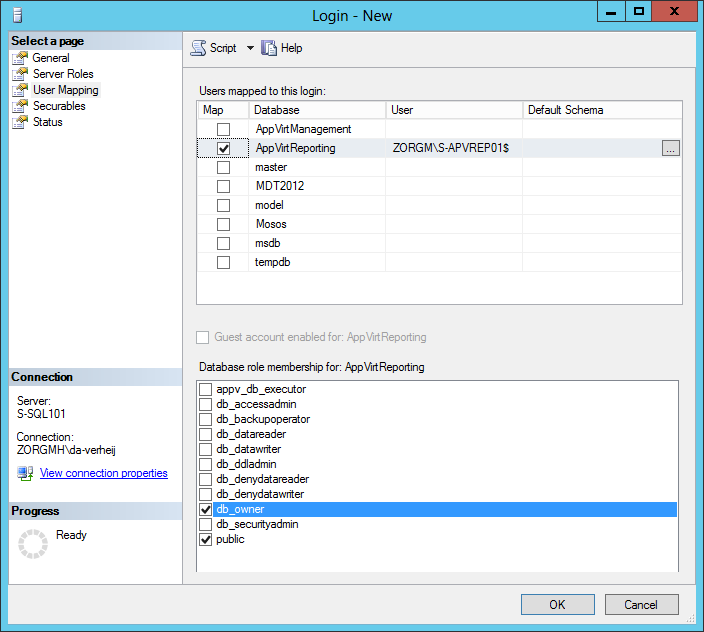 privileges on the AppVReporting database. Unlike with the Management database you can’t nest the computer account in an Active Directory Group (AppVRead / AppVWrite / AppVAdmins). When the computer account has no SQL login an Error event is raised by Server-Reporting with ID 100. After the Microsoft App-V Reporting server is built and configured the App-V client needs to be configured to upload its usage data. 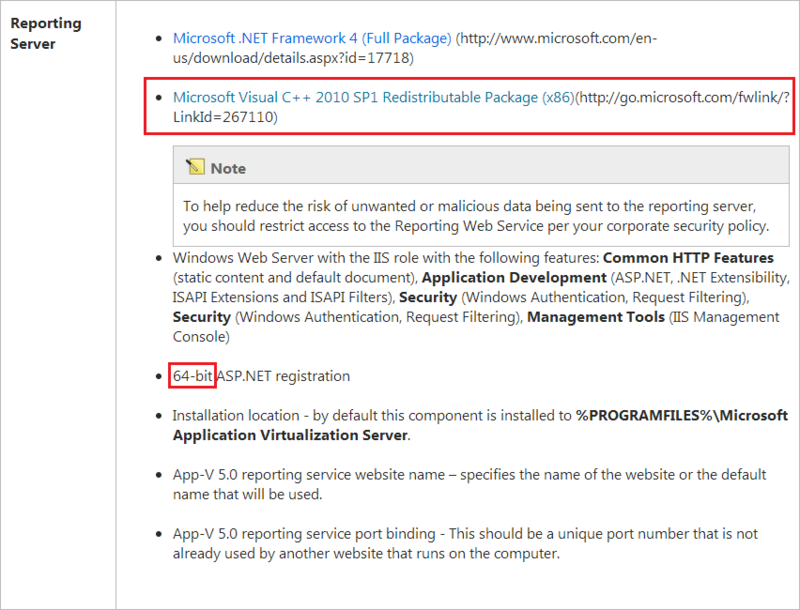 On each App-V Client you need to run the Set-AppvClientConfiguration cmdlet with –ReportingEnabled 1 parameter, more details can at the TechNet Library. Microsoft does not provided reports or software to display reports. Yes you’ve read the last one correct, Microsoft does not supply any mechanism to display the tracked usage of the App-V applications. While the Management Server console looks pretty awesome it’s very basic. So what if you want to create reports based on the collected data? Well, that’s up to you. At hakabo.com you can find an example how create reports using Microsoft Excel or SQL Reporting Services. While Microsoft made a lot of improvements with App-V 5.0, the first complete rebuild since the initial release (Softricity SoftGrid). But the documentation is poor and incomplete, which is a shame. 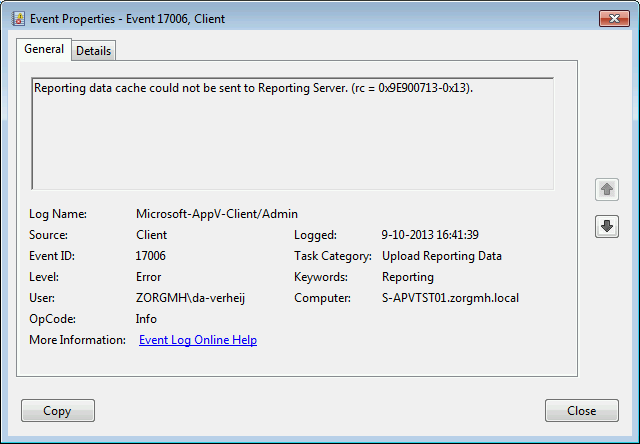 I have a separate server for the SQL Reporting Service, it’s on the same box as the App-V Reporting Server. There is no need to add the prerequisite on the SQL server. Thanks for your help. Is your SQL server Windows Server 2008 or 2012? The SQL Server is 2008R2, the SQL Reporting Server is 2012.